DRW, are you a wet-suit or dry-suit snorkeler? Just curious as to how you do it... If wet-suit, do you use a Mae West? I'm really wanting to snorkel around here: I'm not expecting to see much, but I jus' gotta try it, ya know? This is the guy who lives in the San Francisco East Bay isn't it? I've been diving in SF Bay. The only way anyone is getting me back in there is to write a big check. You're less than 4 hours from some of the best diving in the world. You can head north to the Mendocino/Sonoma Coast. Freediving is big there since many tasty abalone and fish live beneath the waves. You can don your wetsuit, fins, mask, and a lighter than usual weightbelt and have a blast. Those Duckfeet will get a strange look from the guys who spent $300 on carbon fibre fins. You can head south to the Monterey area. I usually scuba there, but still enjoy the occasional freedive at Lovers' Point or the Breakwater. Of course, whichever way you go, check the weather. We lose too many divers who feel compelled to get in the water, even when conditions are nasty. Most freedivers don't wear a vest. I weight myself so that I'm positive on the surface. That makes returning to the surface and surface resting easier. Many of the shops in those areas can give you tips. Ok, they're also gonna try and sell you something. Charlie, I'm gunna snorkel near the San Leandro Creek and Marina and hopefully do some black-water diving: that's 20-mins. from my house... Why? Simply because I can and just for the (expletive deleted) of it--jeez, you should know by now I'm a weirdo Oh, my murky water is about 70 degrees. Dangit, if John can dive extra-local, then so kin I! Hearing you two talk makes me really miss Calif.! Someday, again...I hope! Have fun! Not sure I could get into Freediving because that might be out of my league, but would not mind just snorkeling again. and the strawberries from Santa Maria are also obscene...MUUUUUHOOOOOHAHAHAHA! All in good fun lad! a Skooba-"Totes" from the late 1950s here colour-coordinated with a pair of Champion Hydromatic full-foot fins (both purchased here at Vintage Scuba Supply!) or a modern-day Hydroglove replica. When I joined my university sub-aqua club back in the late 1960s, the Skooba-"totes" was available in the UK through its sole distributor Submarine Products, coincidentally located further up the river Tyne in the market town of Hexham. In the event, probably to copy the other members of the club, I went back then for a British-made Typhoon wetsuit, but I'd always regretted never having the opportunity to try out a period drysuit, so I was delighted when a large-size Skooba-"totes" came up for sale. I ration its use because it's irreplaceable, but I enjoy the process of sealing and venting the suit and I appreciate its simplicity, lightness and relative ease of donning when compared to the tight-fitting freediving-style wetsuits of nowadays. Today's drysuits strike me as being somewhat "overengineered", particularly for snorkelling. I recently picked up on eBay an Estonian-made "Tegur" drysuit from the Soviet era made in the same style as the "totes" and I may give that a try some time too. These suits are interesting to do historical research on and I'm brushing up my Russian to read the original source material on this particular suit. 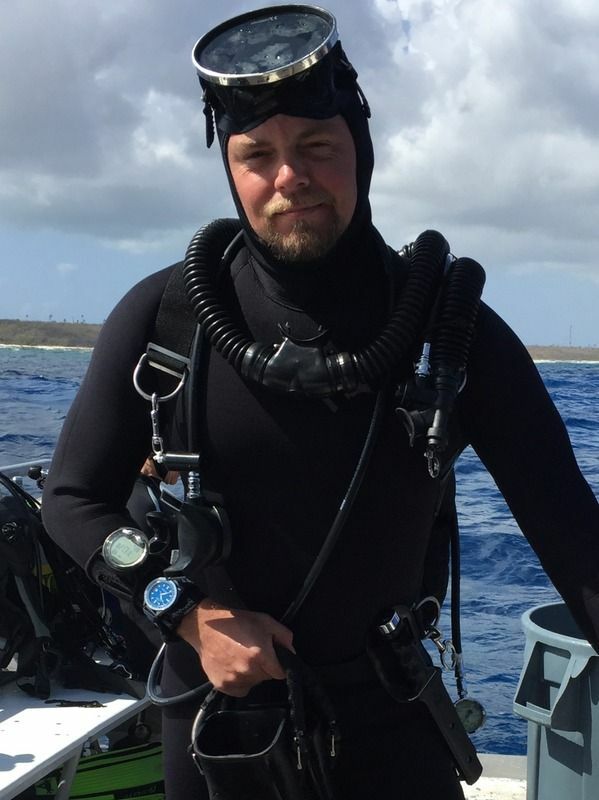 David, thanks for posting the page from "Basic Scuba". For historical reference, I need to pick up a copy someday. TY, if you want a copy, I would highly recommend looking at a local book store: people's greed has made the price so high as to be a sick joke. Although sometimes you can find it on eBait bunched with other books at a human price. Oh and, the first edition is OK, but it's the second that is very sought after. I'll have you know, JB, that yellow was the colour of the year in diving back in 1959! A pleasure, Ty, to be able to post a scan of a page from my first-edition copy of "Basic Scuba", and I'm grateful to JB for pointing out that this title is one instance when the second edition surpasses the first! DRW--WOW--beautiful graphic--YIKES! It's images like that that really show "hand skills" and the training that no one really does anymore, as well as the typography in both images... It may look haphazardly done at first but I assure you there are years of training involved that make it look so simple--SIGH! 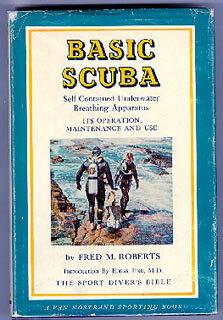 DRW, that cover of "Basic Scuba" is great. There's a local private college that has an annual book sale that people donate to all year long, so one of these may show up there. It'll be a fun hunt. Cool USD ad too! Aquala must have been slow on the uptake with the yellow offerings as yellow wasn't an option until 1960. 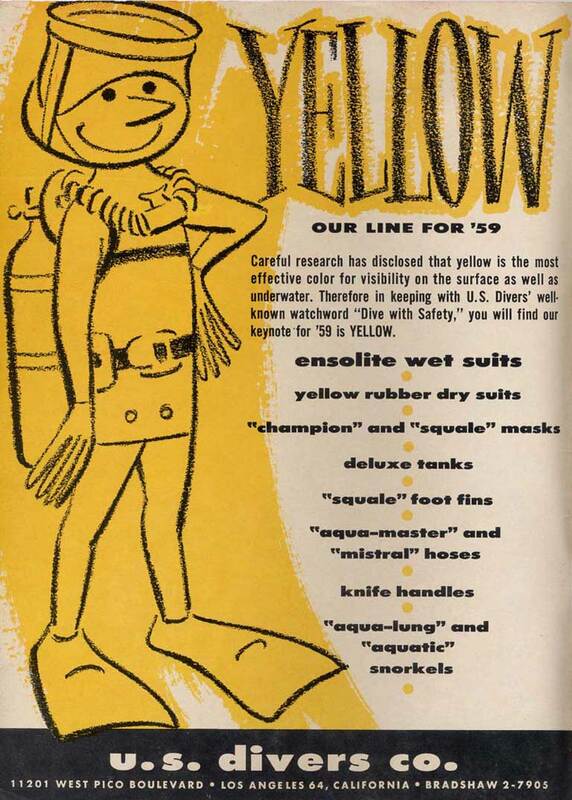 Here's a copy of a mailout flyer/catalog from '60 showing yellow as an option, but wish our graphics were as awesome as the US Divers! That's amazing, Ty. I had no idea that there was ever a yellow version of the Aquala. 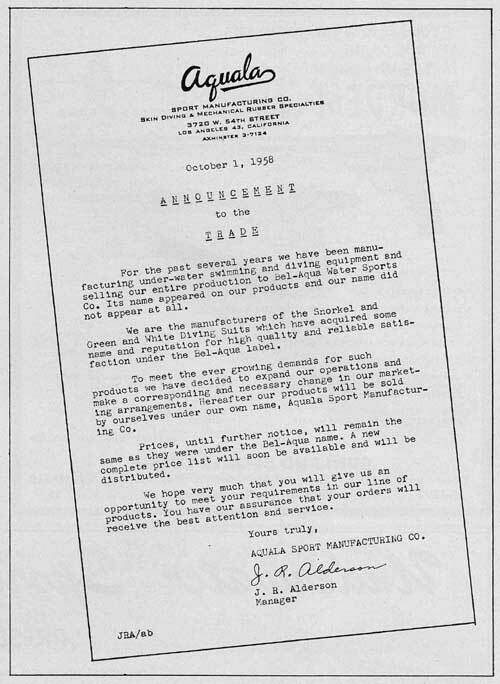 The flyer you've posted is also a useful pointer in determining the company timeline with 1950 as the effective foundation date if 1960 is the 10th anniversary. 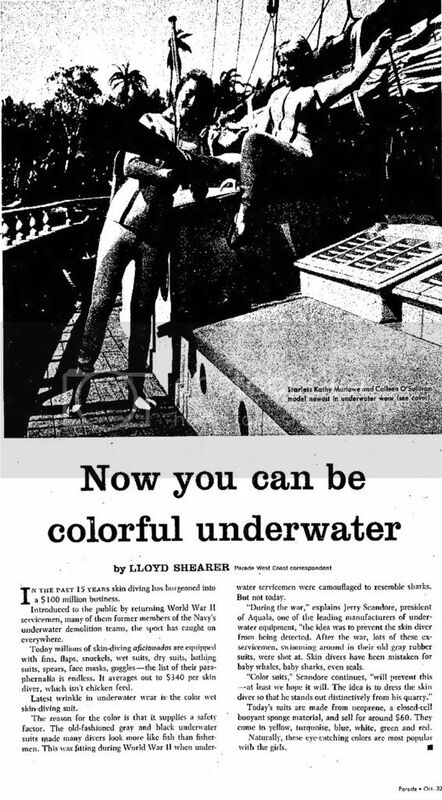 This article quotes Aquala's then president: "During the war," explains Jerry Scandore, president of Aquala, one of the leading manufacturers of underwater equipment, "the idea was to prevent the skin diver from being detected. After the war, lots of these ex- servicemen, swimming around in their old gray rubber suits, were shot at. Skin divers have been mistaken for baby whales, baby sharks, even seals. "Color suits," Scandore continues, "will prevent this — at least we hope it will. The idea is to dress the skin diver so that he stands out distinctively from his quarry." That's a great article on the colors. It's funny how the attitudes changed about color and safety. In a very early copy of a Bel-Aqua catalog that I have '53/54, they point out the camouflaging effects of the green colored suits. I guess it took a few people getting shot, like what happened at that local gar rodeo along that same time-line, before they changed their thinking. I wish I could find some surviving family members for Alderson, and Scandore. I'll have to do some searching. 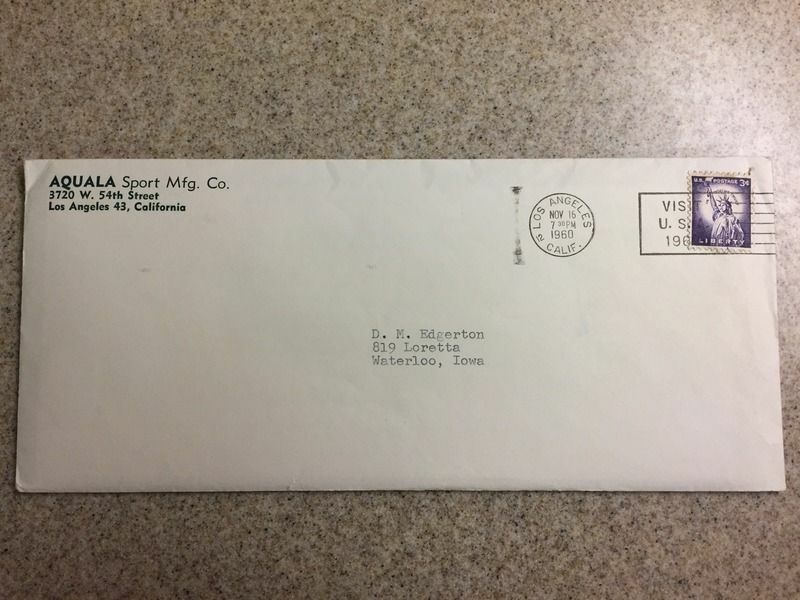 Update: After DRW posted the magazine article, quoting the then president of Aquala (Jerry Scandore), I paid for an advanced internet search and turned up a few phone numbers. I took a shot in the dark, called the first one on the list, and only got a voicemail. I left a message, and just a little while ago, the daughter-in-law of Jerry Scandore called me back. 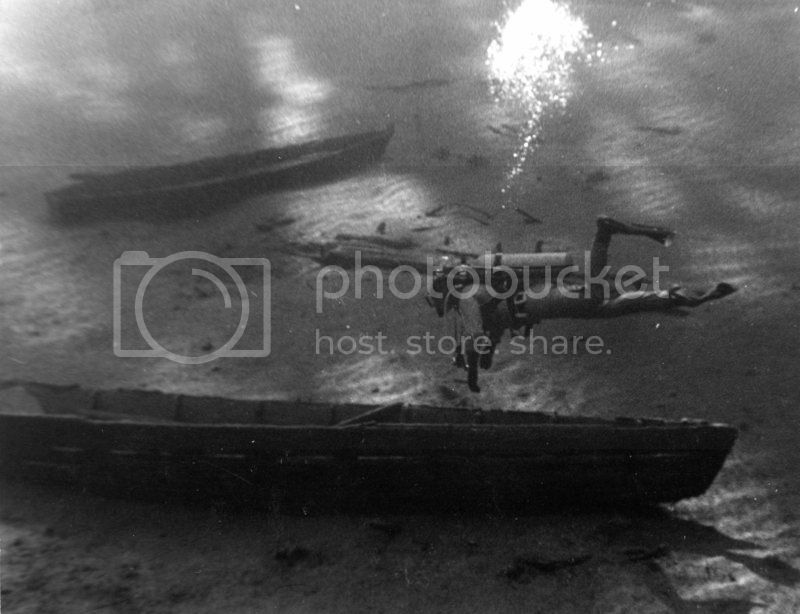 Jerry has been gone now for quite some time, but her husband has all of his father's old photos (she said he was very much into photography, so that's promising) and will go through them to see if there is anything relevant to Aquala. Here's to being hopeful! Ty, thanks for letting us share in your adventure too: please keep us updated--REALLY! I like that DRW caused a chain-reaction with his writing, let's hope the results go critical-mass! 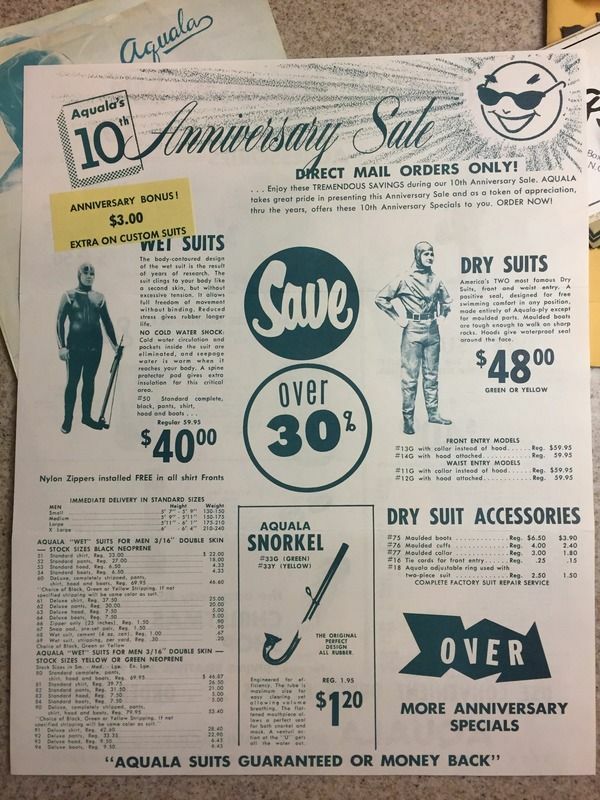 We have been discussing the old-style dry suits, like the Aquala and the Scuba-Toots dry suits. Note that both of these old-style dry suits had attached hoods. To focus on "How'd they do it," you need to know a couple of problems with dry suits. The first is "suit squeeze." This could be an external ear squeeze, or an actual suit squeeze. It is caused by the increasing pressure of descent, so if you are simply swimming with a dry suit on the surface, you won't experience a suit squeeze, or an ear squeeze for that matter. 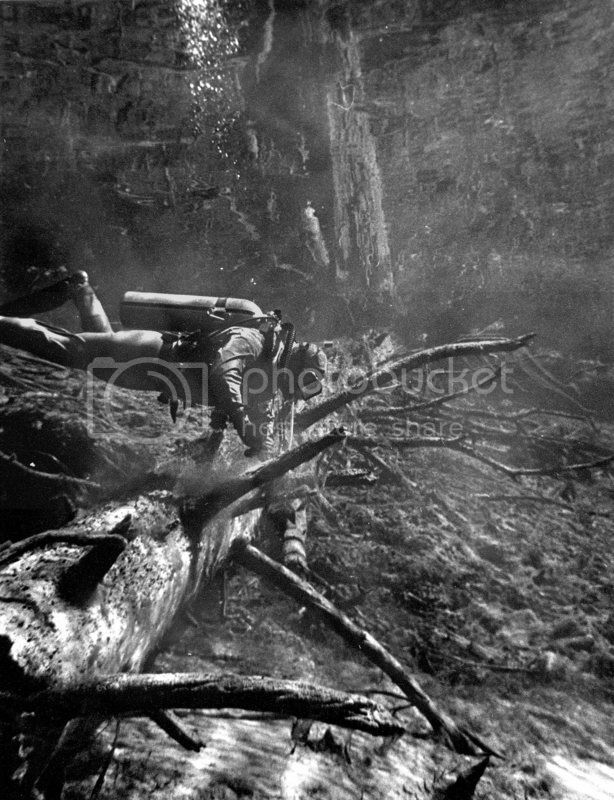 But these were real problems for divers in the 1940s and 1950s. So what did we do? We fitted the dry suit hood over the top of the oval mask's skirt. This was before beveled edges on the masks, or clearing valves. So when a diver exhaled through his or her nose, the air came out from the outside skirt of the mask. With the mask under the hood, exhaling through the nose essentially placed the air into the suit's hood, relieving both the potential for an external ear squeeze and a suit squeeze. This is because any air introduced into the suit distributed itself throughout the suit. I've modified the dry suit to include an astronaut-suit type zipper which is waterproof, an inflation mechanism from the scuba, and a flutter valve on the back of the suit's neck to vent the suit on ascent. The zipper works very well, and provides an easy, waterproof entry. The inflator also works well, butthe flapper valve--that's another story. About 2-3 quarts of water eventually leaked in through this valve which made for a very cold dive (but not as cold as I've been in the same amount of time with a wet suit). The location of this valve at the back of the neck is questionable because head motion apparently tends to open it. Well, back to the drawing boards...Very bad, tactical blunder putting this 1st valve at the back of the neck--Jeeze, it's cold when it leaks. I did this because on a previous dive I had been caught upside down with air in the suit, and had to swim downward as hard as possible to even control the inadvertent ascent. 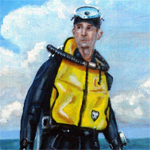 Cousteau's Constant Volume dry suit had solved these problems by having a valve at the top of the hood, and on each foot above the ankle. Venting the suit could be accomplished through the cuff of the arm, but not with my three-finger gloves on in the extremely cold water. So I ultimately replaced this valve with a tube that came over my shoulder, so I could purge air upon ascent. So that's part of what we did. We also had to seal the suit after getting into it. Initially I had a front-entry dry suit, with a "chute" of material that allowed me to enter the suit. Once in, I needed to gather this material into folds, folded upon itself, and pleated. I then folded the chute entry over itself, and twisted it, then bend it 180 degrees before using the rubber bands to tie it off. This was pretty good, but I usually got some water into the suit through this entry. I then, as described above, took this chute out, gluing the chest into a flat chest, and took a waterproof zipper from an US Air Force survival suit into the back of the suit. As mentioned above, that worked pretty well, but it also leaked because my gluing was not too good. Ultimately I regretted removing the front-entry chute, and finally sold the suit to a diver with an allergy to neoprene. From that time onward, I was a wet suit diver. But the dry suit really helped in research diving and underwater photography where a diver is not exercising but rather either observing aquatic life or photographing it. I usually wore a Farmer John wet suit bottoms under my Aquala dry suit, along with a 1/8 inch hooded vest, and one or two sweaters.